This is the seventh (and last) in a series of posts covering the hidden messages that sneak into American churches' proclamation of the Gospel. For more background, please refer to this post. It's one of the most prevalent excuses I encounter in my area of the country for people not attending church. Men who avoid church like the plague cite it more than any other issue for their lack of attendance, from what I've personally heard. The older the commenter gets, the more likely this issue sticks in his craw. No, I'm not talking about folks who are ticked off that the church is preaching budgeting instead of preaching Christ, it's their complaining about the church asking for money. It's as if no other message can get through once the offering plate is passed. The "There they go again shilling for money!" lament is raised and the sermon message is now permitted to go in one ear and out the other. "Always with the money thing! Why do they need so much money, Martha? The pastor makes twice what I do and I caught a whiff of Chanel No. 5 on his wife when I walked past. How much does that stuff cost? A thousand dollars an ounce? And he's asking for money? How low can you get?" Now I'm not naive enough to think that the majority of these grumblers aren't using money as an excuse to sleep in on Sunday or to justify their rejection of Christ. But why do I hear this complaint so often if it didn't carry some actual weight? At one point in my life I attended a well-known Presbyterian church in the toniest suburb in Pittsburgh. The corporate elite of Pittsburgh occupied the pews every Sunday. It had a chauffeur's entrance. The choir (paid) consisted of the leads of the city opera. When industrial meltdowns and financial strife rocked the area in the mid-Eighties, this church was targeted by activists and their Sunday services disrupted for no other reason than wealth. The church I left last year was suburban, middle to upper-class, and rarely asked for money. The pastor had a hard time bringing up the issue. As a result, this huge church was always encountering one cash flow problem after another. My present church is more rural ("penturbian," if you want the exact, trendy word), is lower to middle-class, has a mini-sermon about tithing shared by one of the elders every Sunday, and seems to do a reputable job staying in the black. Not only that, but every time there is a need over and above the regular giving, people always come through with an amount that surprises me. I'd love to draw some kind of conclusion about these three churches, but there are too many variables. One never asked for money because it was loaded. One rarely asked for money, should have had it in abundance anyway, but didn't. One talks about money every Sunday, doesn't seem to want for it, plus it always has reserves. No matter the case, money plays into every aspect of how each of those three churches operate. That's true with every church, every ministry. But is there a way to downplay the whole issue of money so that those who complain that churches are only out for money have no more ammo for their assault? It's Christmastime, so we're now under bombardment by Project Angeltree, Chuck Colson's organization. We donated money to them a few years ago to send the kids of prisoners to summer camp. Christian camping being near and dear to my heart, I couldn't say no when my wife suggested it, even though it violated our decision to only give to charities run by people we personally knew. Starting in September, I swear we get letters from Angeltree every week, plus scores of e-mails. I'm not the type to complain that Christians are always asking for money, but the sheer volume of mail we get from Angeltree makes me uncomfortable. Whatever we gave a few years ago has been more than eaten up from the cost of their mailings to us. So I can understand how some people have a problem with Christians asking for money. This isn't to say that money is not needed, but the sheer amount of money that some churches and ministries burn through is incredible. To sustain whatever they're doing, more and more money is solicited. But is this hidden message that churches and parachurch organizations are always on the lookout for cash really a message we want to send, even if it is not entirely true in every situation? Now I can't speak for parachurch organizations, but I wonder if the way we do church today relies too much on money. I think our buildings are too expensive, not only to build, but to maintain. I don't see in Acts that the early Church spent their money on buildings. Nor was there much in the way of expensive programs and church initiatives. Benevolences were turned around and filtered back to the neediest in the community of believers in the early Church, yet the way we collect church monies today often leaves the givers in the dark as to where their money went. And too often, overhead consumes the majority of money rather than benevolences. Shouldn't we be asking if we're handling money for the Kingdom in the best way possible? Shouldn't that advise the way our churches are structured and operated? What if a church met in homes rather than an expensive church building? What if the pastoral staff went unpaid (or partially compensated), but was large enough so that one person didn't carry the whole ministry load, each staff member living the life of a genuine "tentmaker"? What if we went beyond tithing and set everything we caretake for the Lord on the table so that anything needed was available to anyone at any time for his or her need? What if the Church functioned to unite giver and receiver personally, rather than having our monies go into an ethereal pool of funds? What if our newfound financial reliance on each other allowed us to step out of the rat race? What if churches didn't ask for money at all? Most of all, what if the Church handled money so uniquely that it took away any objections by those who believe that Christianity is all about the Benjamins? I know that Americans are funny about money, but I still hold out hope that one day our churches will look different because we've found a better way to handle it. The house churches in China are destitute compared with the Communist-approved state churches, but somehow they keep growing, effectively making disciples in a way we in America long ago forgot. While there are many mitigating factors in that growth in Chinese house churches, I've got to believe that our attitudes toward money in the American Church are partly to blame for our lack of effectiveness. We've built some fancy churches and installed some expensive programming, but what do we have to show for it? Is it possible that something better could arise in the American Church if all our money disappeared some day? Maybe if it did, the lost might be able to look beyond the our hidden message of money and to the true heart of the Gospel. I think you are scratching at something I’ve been scratching at for the post couple months at my blog. There is a light weight model. It’s blueprint is in Acts, surprisingly. I have a bunch of links to sites I’m reading and pondering regarding house churches. I keep looking for the downsides. I see them, but the upsides are huge too, lightweight, intimate community, everyone’s gift necessary, no staff, convenient, flexible. Thanks, Dan, for another great post with some excellent points. I’ll submit two other reasons money is an issue in the American church – the fallout from the televangelist scandals of the mid- and late-1980’s, some of which involved money, and the prosperity doctrine which continues to rear its ugly head in today’s church. I know what you mean by a “lightweight” model—I think that is the only kind that can function under persecution. Should persecution come to this country some day, we will not be ready unless we have already pared down how our churches operate. Dan thanks for the excellent points. My church has a fancy building and a lot of programs that are offered during the week and your post has me wondering….what do we have to show for it? ccinova, I couldn’t agree with you more! The prosperity teaching is running the name of Christ through the mud. So far, the church I attend does not preach about money. At all. Most of the church members are college students – not very rich. Tithe check sof a few dollars rae common. 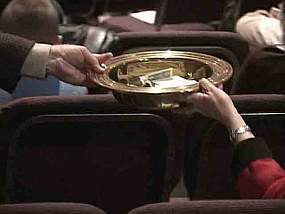 We do not pass a collection plate, and the “tithe boxes” are innocuous (dark brown, not shiny, and for several services I couldn’t figure out where to give my money). We do this deliberately, to avoid the image of having a hand out for money. We run a surplus every year, have four pastors, and NO BUILDING. We rent another church building for Sunday evening services, and have no Sunday AM services. We have missions going out every year, volunteers at a variety of charities around town, small groups meeting, and the pastor preaches from the word. Tithing has been mentioned several times, and there’s one statement I’d like to repeat: “Your money is not important to us. We are supported by donations and tithing, but that’s of much less importance than that you have heard the Gospel of Jesus Christ.” Several members had been going to church for six months or more, and still hadn’t found where to give their tithes, so they had to ask the pastor. Since then, the tithe boxes are *mentioned* every once in a while in passing, and there are little “giving envelopes” in the pew backs, but we never insist on people giving. EVER. Another church I was at in Missouri, a rural church, also never talked about tithes from the pulpit. The pastor wanted nothing to do with such sermons, as it would send the wrong message. He believed (as my current pastor does) that God is certainly capable of supplying the church’s financial needs. This church was not composed of the wealthy. But they were 7 years ahead of their payment schedule on their building. In many ways, the financial issue is a matter of the leaders of the Church trusting in God and not really a matter of budgeting or tithing at all. For the leaders to say, “the church needs you to give more, to give sacrificially” says that the leaders themselves have likely not done so. Especially when they drive expensive vehicles and dress in expensive clothing. The rest of us don’t – why do they “lord it over us” against the Lord’s command? I think you’ve got it. It’s “God wants you rich, prosperous, and happy.” Obviously, that viewpoint has some issues, just ask the martyrs. Another fall-out from expensive programs is the burn-out factor of keeping them going. Enabling congregation members to start their own ministries, be they small or large might be a better way. I too have given to one prominent ministry and dislike the constant emails requesting money. Being prosperous may not be a bad thing if that person truly gives much to the kingdom of God and does it in a way not to draw attention to himself. I think having a sermon about tithing is necessary since it is a biblical concept, but not very often. As you were suggesting what the American church could be, the word uptopia came to mind. I am not as optimistic about the American church. But people like you proclaiming what they should be is a start. Forgive me for seeming rude, but tithing is not a biblical concept. I have just recently finished studying tithing, and I believe that a large amount of the modern church’s problem stems from this tax of the old law upon the new covenant Christian. If you’ve read this blog enough, you should know that what I advocate is that all we have be in play for the Lord and the brethren at all times. That’s not a strict OT tithing system, by any means. I’ll assume you were replying to Helen and not me then. Yes…I have just started reading your blog but my comment was in response to Helen. Dan, I agree with the majority of your points, and enjoy your insights. In regards to tithing, I realize that there are a lot of different definitions of tithing. But I believe that the majority of definitions lead to extremely harmful ends. I can’t really tell what your definition of tithing is, but let me just expound for a second on the problems as I see it. It appears that your definition may be a bit more lax then this, I understand that. The problem however, is that whenever you suggest a percent of someone’s income, it becomes an obligation. The majority of churches frown upon members who fail to give at least 10%. And even if church leaders say that the tithe is not obligatory, the fact that they are mentioning a proportion negates that statement. Now, I do agree with the comment that Christians in America can easily give more then what they do give now. But the word “tithe” alone carries many problems with it. There are a lot of other problems with tithing, and there are also many definitions. Thats why I mentioned Dr. Kelly’s website, because there is no way I can cover every aspect in a few short paragraphs. But I am suggesting that this matter deserves a closer look. Appreciate the thoughts, and as a staff member with a parachurch ministry, I also feel uneasy about the amount of mail our org sends to folks who give to us. However, I will say that to have a goal of a “tentmaker” ministries might be off a bit – frankly, it depends on the time and place. Paul made tents in certain situations – especially when asking for money might be a stumbling block to the Gospel. But in many situations, he was fully supported. Richard Pratt wrote an excellent commentary on 1 Corinthians and he made the point that pastors and full time Christian workers should be willing, like Paul, to put their salary aside if it is going to put something in front of the Gospel to make people stumble. I would say that the goal should be a healthy church – where people’s hearts are being changed so they want to give, where they are being challenged to get away from worshipping the dollar and instead worshipping Christ. If a pastor or pastors are on a church payroll because it is their meal ticket, then you have a problem. However, if a church joyfully supports a pastor or pastors who are then freed up to preach the Word and instruct the church, all the better.